Metropolitan Congregations United(MCU) broke new ground on Sunday, October 7 by announcing its intention to incorporate voter engagement in its signature Break the Pipeline campaign as well as begin the process of creating a rural/urban coalition with other organizations from across the state. Break the Pipeline focuses on issues of the school to prison pipeline in areas of education, school discipline, policing, and juvenile justice. These are issues that impact schools and students in outstate Missouri as well as in the more urban areas of the state. 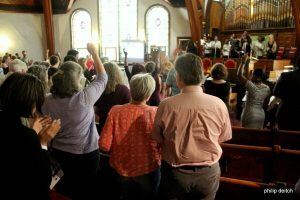 “We changed up our regular annual mass meeting and instead hosted four meetings,” said Rev. Dr. Dietra Wise Baker. Rev. Baker is the lead organizer for the Break the Pipeline campaign. She explained that public meetings were focused in the school districts where MCU leaders and congregations have been most active. Meetings were held in North County where work is being done in the Ferguson-Florissant and Hazelwood Districts. Webster Groves and St. Louis city were also meetings sites. For the first time MCU hosted a public meeting in St. Charles County. Leaders there have been active in all five of the county’s school districts. “Our districts have been doing great things around reducing the use of out of school suspension,” said Jane Cox, of the education task force in St. Charles. “We regret that only one district choose to attend and give people a rundown on the ways they are having success.” St. Charles City Public School District superintendent, Dr. Jason Sefrit attended the meeting noting that he and his district will always work at putting students and their well-being at the center of any discussions of student discipline. All four meetings were able to announce success in the creation of Memorandums of Understanding(MOU) between districts and the law enforcement agencies that provide School Resource Officers(SRO). Webster Groves and St. Charles City have successfully created documents that will codify the duties expected of an SRO and insure that school discipline decisions are made only by school administrators. The Ferguson Police Department has, by its Department of Justice consent decree, created an MOU with the Ferguson-Florissant district. Amy and Penn Driller, parents of a St. Charles West High School student are pleased with the MOU their school district has but note that misunderstandings and miscommunications can happen with documenting expectations of both the MOU and school administration. “We’re glad that our superintendents and police chiefs have good relationships,” said Mr. Driller. “There may not be those same strong relationships in a few years. Putting things in writing assure continuity no matter who’s in charge.” MCU-St. Charles hopes to build on the success with St. Charles City district and work with other districts and departments to insure parents, teachers and students have level of confidence in their SRO’s. In 2019, MCU will join with the MOVE Collaborative, a collective of organizations across the state in creating a rural/urban partnership. The goal of this coalition will be push back against the traditional powers that separate black, brown and white, rural and urban. “The issues in the rural community mirror those in the urban community,” said Rev. Dr. Wise Baker. “We’re organizing around mutual interests, needs and values. 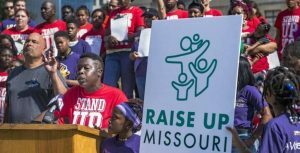 Across the state our schools are impacted by transportation funding, shifting populations, poverty and overburdened tax bases.” MCU and the MOVE Collaborative will organize school officials alongside members of the General Assembly to affirm the centrality of quality public education for all Missouri students. Voter engagement was a topic in all the meetings. Interacting with voters, whether phone banking or door knocking is allowing MCU to share with more of the community their Pipeline campaign as well as their support of Amendment 1 and Proposition B noting. Both impact the integrity of school districts and the welfare of district families. A highlight of the St. Charles meeting was the announcement that the Historic Franklin School has been sold and will be redeveloped. During days of segregation, it was the only high school for African-American youth in St. Charles, Warren and Lincoln Counties. The planned sale of the building prompted Franklin alumni, Tom and Mary Stephenson to create with MCU leaders a signature campaign in St. Charles congregations. “We collected over 1,300 signatures from people asking the St. Charles City Public School district to act responsibly in selling the building,” said Mary Harrison, a leader with the Education Task Force. “We wanted to be sure any potential buyers understood and honored the historic significance of the school. New owner, Rod Thomas and TriStar have agreed to a marker at the site as well as one day a year for public visits. “One in four minimum wage earners is a parent, impacting over 260,000 children,” said Claudia Jean Potts at the Webster Groves meeting. Two thirds of minimum wage earners are women. One third are workers 40 or older. Over 100,000 are senior citizens. She continued by noting that raising the minimum wage helps Missouri workers take care of their families and reward their hard work. It provides an injection of dollars into small, local businesses. It helps with employee retention, reducing costs and developing happier, more loyal employees. Amendment 1 is intended to correct political system with little control over the pay to play options. Candidates for the state legislature don’t have to campaign if they can secure one or two supporters who can contribute millions of dollars to completely support a campaign. Amendment 1 would limit the amount a single donor can contribute. In addition Amendment 1 would also severely limit the amount a lobbyist could spend on a politician, require a two year time out before legislature could become a lobbyist after leaving office, require all legislative meetings to come under the Sunshine Laws, and maybe most importantly completely revamp the state’s districting rules ending gerrymandering.